Tar remover is a heavy-duty chemical cleaner that is used to remove tar/bitumen, a black and highly-viscous petroleum product. Tar Remover Poisoning is the accidental or intentional intake of products containing tar remover. What is Tar Remover Poisoning? What are the Causes of Tar Remover Poisoning? What are the Signs and Symptoms of Tar Remover Poisoning? How is First Aid administered for Tar Remover Poisoning? Who should administer First Aid for Tar Remover Poisoning? 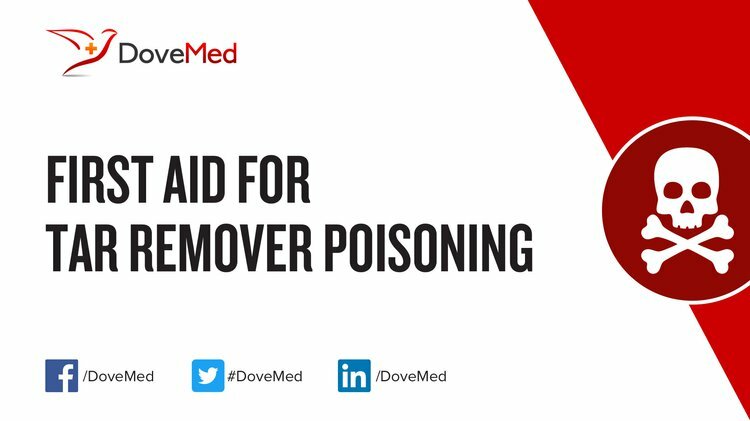 First aid for Tar Remover Poisoning is administered by healthcare professionals. What is the Prognosis of Tar Remover Poisoning? How can Tar Remover Poisoning be Prevented? Gnaneswaran, N., Perera, E., Perera, M., & Sawhney, R. (2015). Cutaneous chemical burns: assessment and early management. Australian family physician, 44(3), 135. Mrazová, K., Navrátil, T., & Pelclová, D. (2012). Consequences of Ingestions of Potentially Corrosive Cleaning Products, One-Year Follow-Up. Int. J. Electrochem. Sci, 7(3), 1734. Robinson, E. P., & Chhabra, A. B. (2015). Hand chemical burns. The Journal of hand surgery, 40(3), 605-612. Bucksch, M. (2012). Emergency first aid for dogs: at home and away. Veloce Publishing Ltd.
Bhandari, P. N., Kumar, A., Bellmer, D. D., & Huhnke, R. L. (2014). Synthesis and evaluation of biochar-derived catalysts for removal of toluene (model tar) from biomass-generated producer gas. Renewable Energy, 66, 346-353. Bhandari, P. N., Kumar, A., & Huhnke, R. L. (2014). Simultaneous removal of toluene (model tar), NH3, and H2S, from biomass-generated producer gas using biochar-based and mixed-metal oxide catalysts. Energy & Fuels, 28(3), 1918-1925.